Energy Efficient Lab Homes - PNNL has two (Baseline & Experimental) 1,500 square-foot double-wide manufactured homes ("Lab Homes") set up side by side for the specific purpose of conducting energy efficiency & buildings to grid research. The Baseline Home serves as a control typifying an average existing home in the inland eastern Pacific Northwest region, while the other, the Experimental Home, is used to test a new technology. The Lab Homes serve as a project test-bed and are fully instrumented with controllable circuits, dual heating systems, environmental sensors, occupancy simulation, and a weather station. Researchers and sponsors can access results and reports as new energy saving technologies are tested. For more information go to the PNNL Lab Homes website. Lighting Metrology Laboratory - PNNL maintains a nationally accredited lighting test laboratory and staff expertise to effectively evaluate advanced light sources including LED modules and dimmable, color-tunable luminaires. 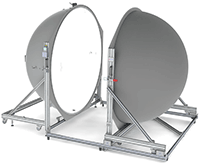 The Lighting Metrology Lab's wide-ranging capabilities include the ability to perform photometric, spectroradiometric, photoelectric, long-term performance, and stress testing. Connected Lighting Test Bed - The Connected Lighting Test Bed in Portland, OR enables in-situ research and evaluation of connected lighting systems. The purpose of this research is to improve the performance of emerging networked lighting systems, to support maximum energy efficiency, lighting service, and building performance benefits. Hands-on testing and studies focus on energy reporting accuracy, interoperability between devices and systems, data-driven energy management, cybersecurity vulnerability, and key new features. 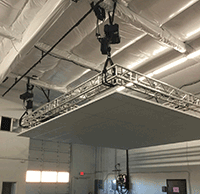 The lab contains two 18’ x 18’ variable height ceiling grids installed in a high-bay space. These grids are attached to lighting trusses and electric hoists that can raise and lower test luminaires to support a wide range of tests and measurements. Additional spaces within the facility are used for device-level energy measurements, visual lighting science experiments, and prototype lighting technology evaluation.